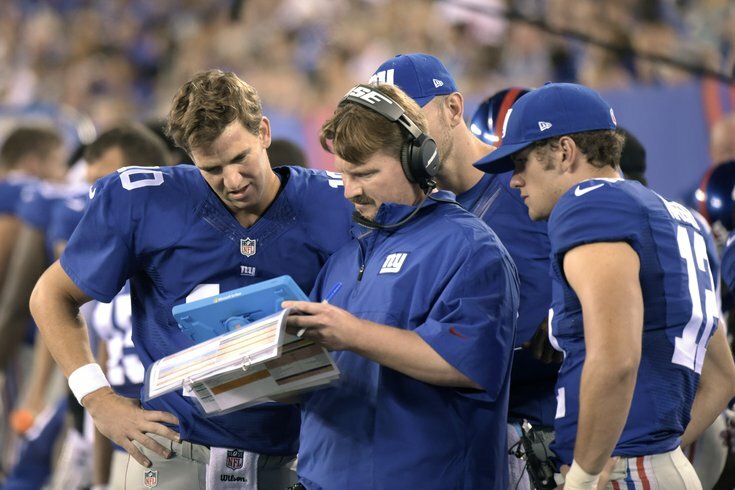 New York Giants offensive coordinator Ben McAdoo confers with quarterbacks Eli Manning, left, and Ryan Nassib, right. Even as I write this, there are likely new rumors, reports and speculation about who the Philadelphia Eagles will hire to replace Chip Kelly, who was let go last week prior to the conclusion of his third season, as their next head coach. That's just the reality of life when your football team is without a coach. The fans want to know -- and, of course, offer their opinion. The media want to be the first to tell you who the next coach will be -- even if the organization hasn't even finished interviewing potential candidates. There's often misinformation everywhere -- don't forget agents are involved. And the result can be, well, maddening. How about we just let the Eagles hire a coach and then react? Otherwise, it’s just noise that consumes and deafens us all at the same time. Could Gase help young Eagles' WRs maximize potential? The rest is just speculation, at least when it comes to who will ultimately emerge as the Eagles next head coach. Between now and when that day finally arrives, you are free to believe whatever coaching rumors you like, just don't be disappointed if they all don't pan out. After all, only one guy is actually going to get the job. Below, you'll find eight candidates that have been linked to the Eagles -- none of which are from the college ranks and all but one (Staley) is a current NFL coordinator. Is the team's next head coach among them? INTERVIEW? : Yes. Eagles confirmed he met with team on Tuesday. THE LATEST: Tuesday's report that Gase was scheduled to meet with the Eagles this weekend for a second interview may have been a little premature. Sounds like Adam Gase impressed in Philly. I'm told the #Eagles plan to bring him back for a second interview this weekend. According to Ruben Frank of CSN Philly, Gase has not scheduled another interview with the Eagles ... yet. But the source said no second interview has been planned yet with any candidate. He said this doesn’t mean the Eagles weren’t impressed with Gase or they don’t consider him a good candidate. Our own Jimmy Kempski took a look at whether or not Gase could help the Eagles young wide receivers improve, in addition to Sam Bradford or whomever is under center for the team next season. I'm told the #Dolphins are making a strong, potentially persuasive push for #Bears offensive coordinator Adam Gase. UPDATE -- The Eagles have interviewed McAdoo, the team confirmed Thursday. INTERVIEW? : Reportedly met with the Eagles on Thursday. Giants offensive coordinator Ben McAdoo will interview with the Eagles tomorrow. Met with the Giants yesterday. Of course, they know him. THE LATEST: The Giants may not want to let McAdoo go. According to Paul Schwartz of the New York Post, if the Giants want to hire a coordinator, "it would be difficult to see them going with someone other than McAdoo." He has been likened to a young Andy Reid. Both spent five years coaching tight ends for the Packers before switching to work with quarterbacks. Both are relatively low-profile and outwardly reserved. Reid was 40 when he was hired in 1999 as head coach of the Eagles. McAdoo is 38. THE LATEST: According to Jason La Canfora of CBS Sports the Eagles will interview Pederson on Sunday. Pederson, who served primarily as a backup QB for nearly a decade, including one season with the Eagles (1999) -- was an assistant in Philly from 2009-12, during the end of the Andy Reid era. INTERVIEW? : Eagles have reportedly requested an interview. Bucs general manager Jason Licht confirmed Thursday during a press conference that Koetter would be a candidate, also emphasizing that his relationship with rookie quarterback Jameis Winston was "an important bond." #Bengals defensive coordinator Paul Guenther will interview with #Browns on Sunday after the game, source said. #Eagles also requested him. THE LATEST: While the Eagles have inquired about the Bengals defensive coordinator, it's been their offensive coordinator -- Hugh Jackman Hue Jackson -- that has drawn more interest from fans. And according to Jeff McLane of The Inquirer, they haven't even reached out to him yet. #Eagles have requested to interview #Bengals defensive coordinator Paul Guenther, per @RapSheet. Still haven't for Bengals OC Hue Jackson. INTERVIEW? : Nothing to report so far. THE LATEST: Alex Marvez of FOX Sports first reported the Eagles interest in Austin over the weekend, but there hasn't been much else since. However, it's worth noting that the two other names mentioned -- Gase and McAdoo -- were among the first two outside candidates the Eagles interviewed. INTERVIEW? : Yes, confirmed by Eagles.